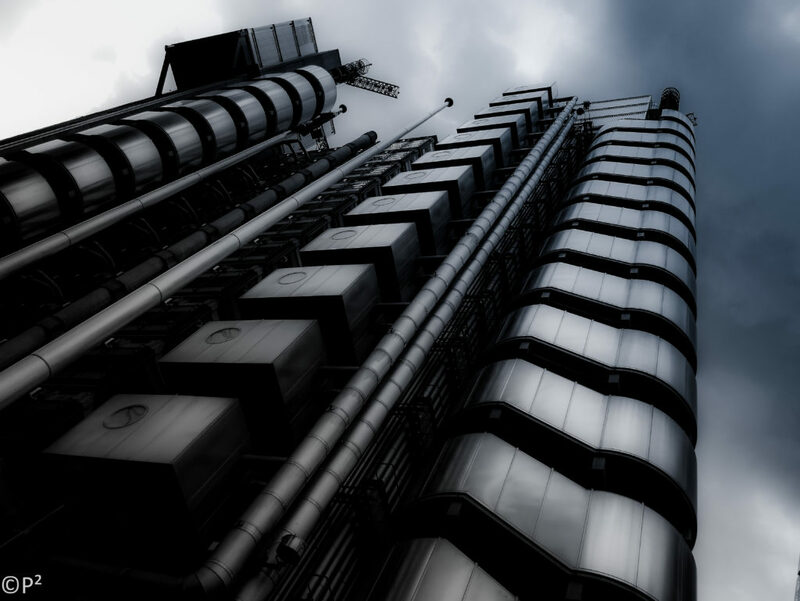 The Lloyd’s building (sometimes known as the Inside-Out Building) is the home of the insurance institution Lloyd’s of London. 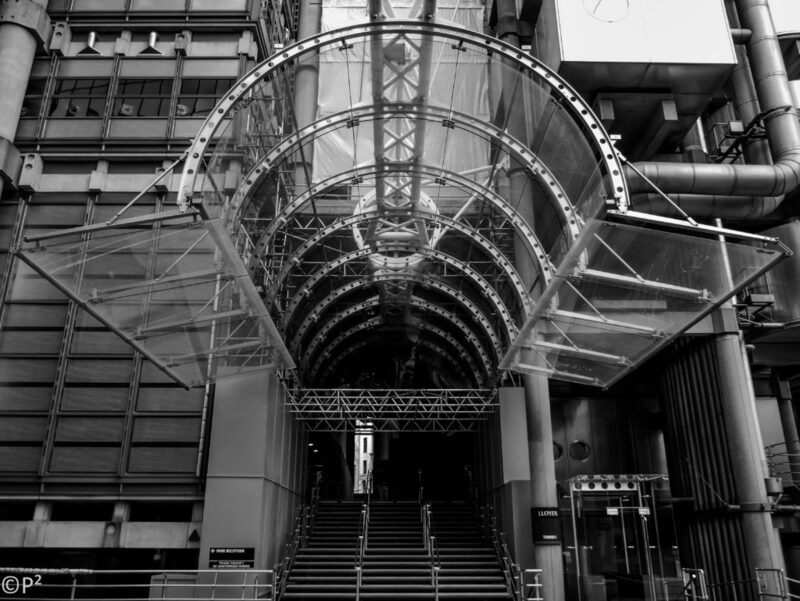 It is located on the former site of East India House in Lime Street, in London’s main financial district, the City of London. 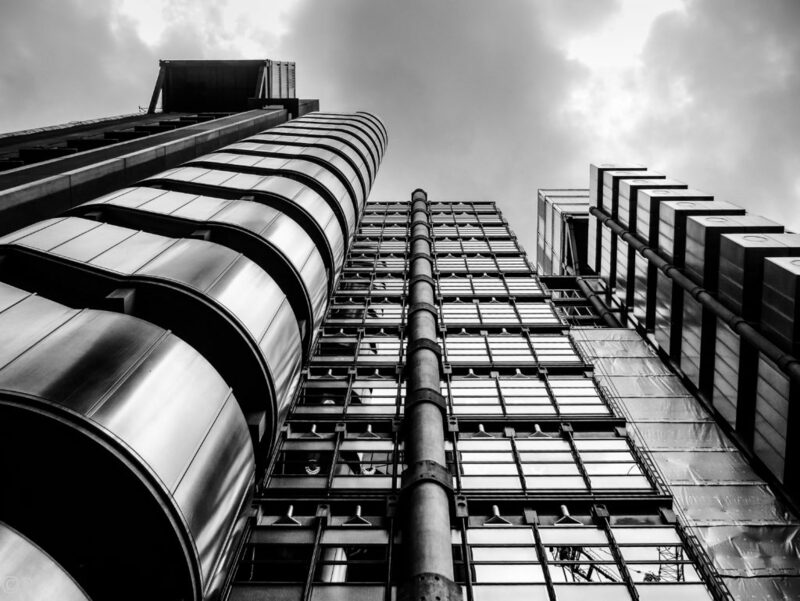 The building is a leading example of radical Bowellism architecture in which the services for the building, such as ducts and lifts, are located on the exterior to maximize space in the interior. Twenty-five years after completion in 1986, the building received Grade I listing in 2011; it was the youngest structure ever to obtain this status. It is said by Historic England to be “universally recognized as one of the key buildings of the modern epoch”. 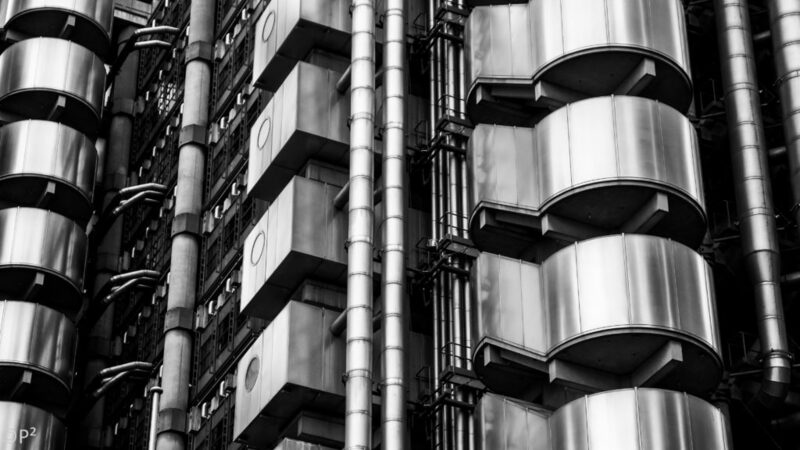 The current Lloyd’s building (address 1 Lime Street) was designed by the architect company Richard Rogers and Partners (now Rogers Stirk Harbour + Partners) and built between 1978 and 1986. Bovis was the management contractor. 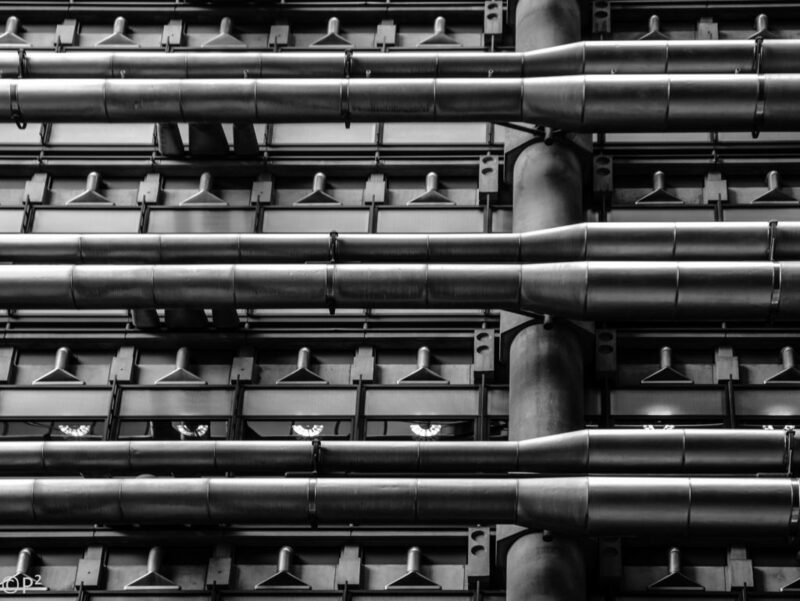 Like the Pompidou Centre in Paris (designed by Renzo Piano and Rogers), the building was innovative in having its services such as staircases, lifts, ductwork, electrical power conduits and water pipes on the outside, leaving an uncluttered space inside. The 12 glass lifts were the first of their kind in the United Kingdom. 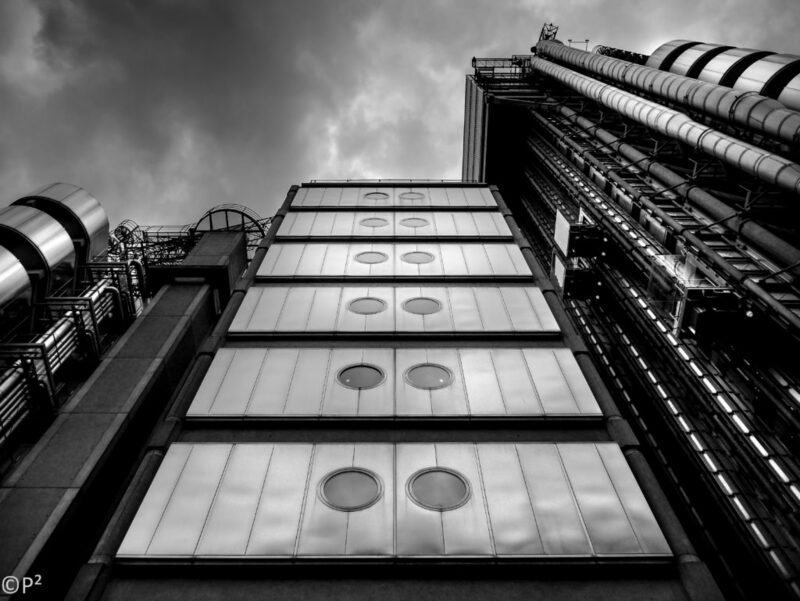 Like the Pompidou Centre, the building was highly influenced by the work of Archigram in the 1950s and 1960s. The building consists of three main towers and three service towers around a central, rectangular space. Its core is the large Underwriting Room on the ground floor, which houses the Lutine Bell within the Rostrum. Also on the first floor is loss book which for 300 years has had entries of significant losses entered by quill. The Underwriting Room (often simply called “the Room”) is overlooked by galleries, forming a 60 metres (197 ft) high atrium lit naturally through a huge barrel-vaulted glass roof. The first four galleries open onto the atrium space, and are connected by escalators through the middle of the structure. The higher floors are glassed in and can only be reached via the exterior lifts. The 11th floor houses the Committee Room (also known as the Adam Room), an 18th-century dining room designed for the 2nd Earl of Shelburne by Robert Adam in 1763; it was transferred piece by piece from the previous (1958) Lloyd’s building across the road at 51 Lime Street. The Lloyd’s building is 88 meters (289 ft) to the roof, with 14 floors. On top of each service core stand the cleaning cranes, increasing the overall height to 95.10 meters (312 ft). Modular in plan, each floor can be altered by the addition or removal of partitions and walls.